Primi piatti: il riso | CUCINA ITALIANA – ITALIAN FOOD | Il cibo con il sole dentro – With the sun inside! This morning in my vegetable’s garden I found fresh spinach and I can’t resist: let’s make Risotto! Today when I saw Castelmagno cheese on the shelf of my favorite market , I could not resist! It is one of my many passions is food and not very easy to find in my town. It is a cheese from Piedmont and it is considered the “prince” between cheeses of this region. The taste varies greatly according to the time of maturation: delicate and sweet when young, becomes a gently intense, spicy and crumbly … .. in short, it is real delicacy! Boil the rice in salted water for about 30 minutes. In meanwhile in a skillet with olive oil, chopped red onion and courgettes in sticks (without the inner pulp9 (pls keep half courgette!) Put it on the fire and cook for about 5 minutes. In a saucepan, boil the eggs for 10 minutes. Cut the half courgette kept apart in thin strips and season with olive oil, salt, lemon and chilli, and place it in serving dish. Drain the rice and sauté it 3 minutes in the pan with the courgettes, add grated Castelmagno cheese. 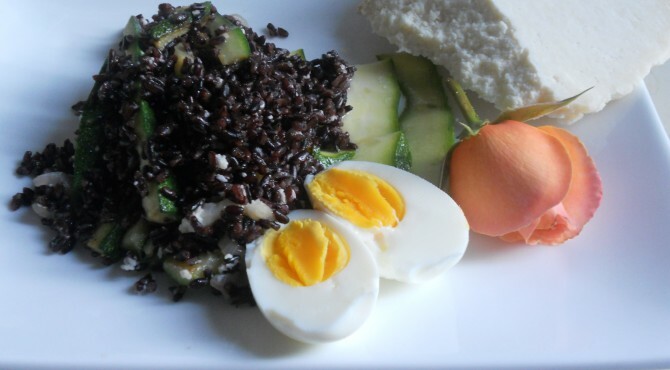 Put the rice on top of the courgettes carpaccio, and garnish with eggs. In a deep pan put a little ‘oil, onion and garlic finely sliced, and let them brown. Add the chicory cut into small pieces (keep a tablespoons raw :we ‘ll need it for the final preparation of the dish) and the basil leaves and let cook for a few minutes, basting with white wine. Add salt and chilli. Put the rice and adding the hot broth, cook (about 20 minutes, stirring all the time!). When the rice is cooked add the mascarpone and let the rice stand, covered, for 10 minutes before serving. In the meanwhile in a baking dish, prepare the strips of grated Parmigiano, put the cheese in waxed paper and cook at grill until it is golden. 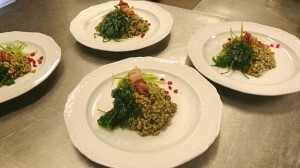 Let them cool and serve it with the risotto, with a tablespoon of raw chicory salad. 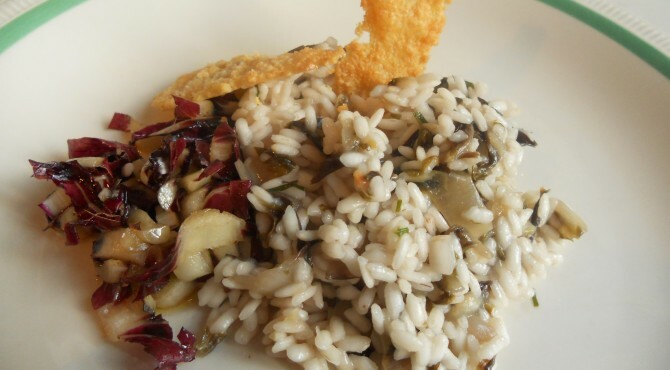 Il binomio del bosco nel risotto, diventa un trionfo! Scegliamo gli asparagi tagliandoli con le mani, fino a quando sono teneri. Mettiamo a bollire i gambi scartati in una pentola con abbondante acqua e un pizzico di sale: useremo questo liquido per la cottura del risotto. In una padella con olio e uno spicchio di aglio, facciamo cuocere gli asparagi, con un bicchiere di vino bianco; aggiustiamo di sale e peperoncino. Quando sono cotti, frulliamo metà del composto. In questa deliziosa poltiglia, grattugiamo il tartufo. 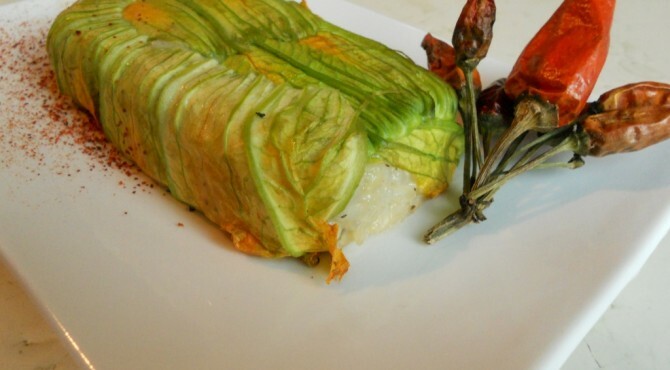 A questo punto mettiamo il riso e facciamo cuocere per 20 minuti, girando continuamente e aggiungendo il liquido dei gambi degli asparagi (attenzione a non abbandonarlo neanche un minuto, perchè vince lui!!) . Quando il riso è cotto, lasciamo riposare, coperto, per 5-6 minuti. In una teglia da forno con carta antiaderente, facciamo delle strisce di parmigiano grattugiato (circa due cucchiaini) larghi 5-6 centrimenti. Passiamoli in forno a grill fino a quando non diventano una linguetta spiaccicata e dorata.Togliamoli dal forno e lasciamoli freddare. 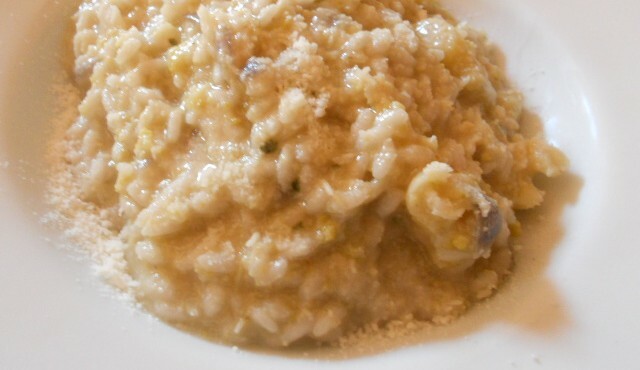 Abbiamo creato delle deliziose guarnizioni che possiamo servire sopra al nostro risotto. We choose the asparagus, cutting by hand until they are tender. Boil the stems discarded in a pot with 1 liter of water and a pinch of salt: we will use this liquid to cook the risotto. In a frying pan with oil and a clove of garlic, let cook the asparagus with a glass of white wine, add salt and pepper. When they are cooked, blended half this mixture. In this delicious mash, grated truffles. At this point add the rice and let cook for 20 minutes, stirring constantly and adding the liquid from the stalks of asparagus (do not leave even a minute, because the rise will always win!). When the rice is cooked, let it rest, covered, for 5-6 minutes. In a baking tray with greaseproof paper, we make the strips of grated Parmesan cheese (about two teaspoons) 5-6 cm wide. Pass them in the oven grill until it become a gold golden tab squashed. 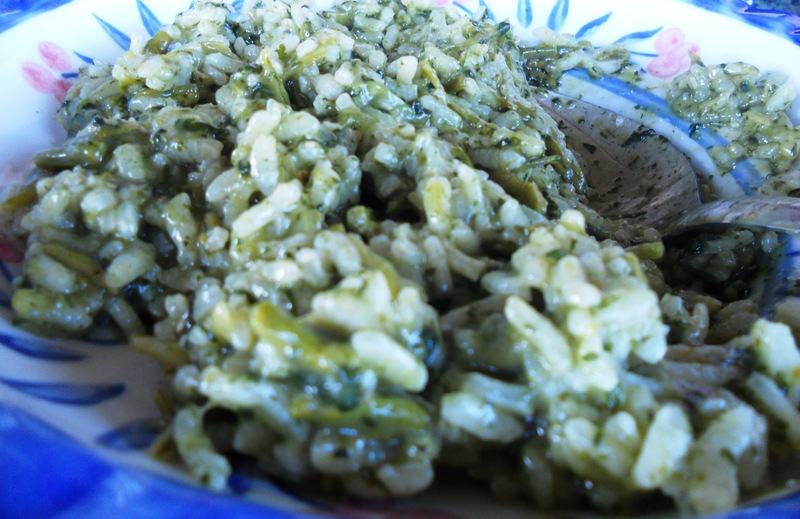 Let them cool and you will have created delicious trimmings to serve above your risotto.